"We have attempted to hold off on further price changes this year and only took this action after very careful consideration on the impact to our valued customers based on current market pressures," Mars said in a statement. On Monday, rival Hershey said it would be increasing its wholesale prices by about 10% in the US as it warned full-year profits would be at the lower end of its forecasts. Confectionery and snack firms have been hit by the fall-out from rising commodity prices driving up the cost of everything from cocoa, sugar and peanuts to fuel. 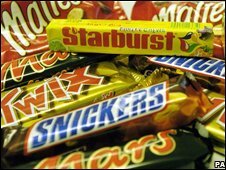 Cadbury's and Nestle are just some of the UK companies who have admitted current economic woes are beginning to bite. They say that in an effort to prevent price rises for pressured consumers they have scaled back their product - offering smaller snacks for the same price. Now a Cadbury's Family Share chocolate bar weighs in at 230g rather than 250g. Proctor & Gamble's Pringle's have less pop - weighing 170g rather than 200g. And you'll be offering your last Rolo a lot sooner - Nestle are now putting just 10 of the sweets into a pack rather than 11. Even brewer Scottish & Newcastle has cut back on the amount of cans in its multipacks of Strongbow cider while Kraft have shaved 2.5g from each of its Dairylea cheese triangles.